Snubbed by Saudi Arabia, What Happened at the Arab summit? 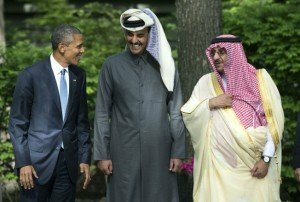 While hosting the six-nation Gulf Cooperation Council (GCC) in Washington and at Camp David last week, Obama faced a hard sell: assuring the United Arab Emirates, Kuwait, Bahrain, Oman, Qatar and Saudi Arabia that the United States has an Iran policy that encompasses their security needs. He also tried to encourage the six countries to work together for their own collective security, but in a way that dovetails with American strategic goals. Only two of the six GCC nations even bothered to send heads of state. Three of the missing leaders pleaded health issues as their excuses to stay home; Saudi Arabia said its ruler, King Salman, didn’t travel due to humanitarian commitments to Yemen. The Saudi snub in particular reflects the concern, among America’s Sunni Arab allies, that the United States isn’t taking a hard enough stance toward Iran and its proxies. The Saudis’ commitment to ensuring that the United States is ready to oppose Iranian-proxy forces even as rapprochement moves forward is clearly seen in Yemen. After tamping down the Arab Spring in Sana’a and easing a sympathetic government into power with Saudi support, America militarized Yemen. This approach was intended to be a model for a new “small footprint” strategy, where a compliant local government would be paired with drones and Special Forces to conduct joint strikes against Islamic militants fueled by intelligence from the United States. Obama cited Yemen as a successful example of this strategy as recently as September 2014. Yet the dissolution of that country, and the chaos that followed a tail-between-the-legs evacuation of American diplomats and Special Forces, instead planted an Iranian-supported rebellion on Saudi Arabia’s border. When Washington did not decisively move to counter Iranian gains in Yemen, the Saudis lashed out in late March of this year. The recent Saudi royal succession, which concentrated power in a smaller circle, may have also put pressure on the new king to act aggressively. Though the Saudi attacks in Yemen are tactically aimed at securing its southern border, strategically they send a message to Iran to step back. They signal to the United States that Saudi Arabia wants Washington to become more engaged in the situation and perhaps use air strikes and covert forces, similar to what it is doing in other parts of the Middle East. Increasing hostilities, including the Saudi use of American-supplied cluster bombs, forced Obama into that rock-and-a-hard-place that increasingly defines Washington’s policy in the region. He needed to ensure Saudi military action did not bleed over into open conflict with Iran, while demonstrating the United States would stand up for its allies. Obama’s tepid answer — saber rattling in the form of an aircraft carrier moved into the area — seemed to back down the Iranians for now, but said very little about long-term strategy. The Saudis demonstrated in Yemen what might be called unilateral collective defense; though they could not assemble a robust pan-Arab force and have conducted most of the bombing themselves, they acted with regional assistance in the form of limited air strikes, reconnaissance help and statements of support. This is very much at odds with Washington’s idea of what pan-Arab collective defense should look like. After all, how far can relations with Iran progress — never mind the goal of regional stability — when America’s allies start new wars against Iranian proxies? No matter who showed up for last week’s conference, Obama could only propose his own version of collective defense, a region-wide missile defense system. This was a significant step down from the NATO-like agreement with the United States the GCC would have prefered. (Stated plans to create an “Arab NATO” are still in process.) Obama included new arms sales to GCC states that, while afraid of Iran, still remain wary of one another. The United States wants to be the glue that holds the arrangement together. That would seem to be an optimistic goal since American glue failed to hold together any substantive pan-Arab force in Iraq and Syria, and tens of billions of dollars in arms sales over the years apparently have not been reassuring enough. If Washington doesn’t reassure the GCC countries that it will oppose Iran in proxy wars across the region, expect more independent action from America’s allies in the Gulf. America cannot walk away from these countries; oil, long-standing alliances and U.S. strategic facilities and bases housed across the GCC are factors. This may lead to Washington finding itself dragged into any number of fights it does not want, or stuck playing intermediary between the Saudis and Iran, as it is now doing to help broker a short cease-fire in Yemen. Think Syria next, where the Saudis are already working on a deal with Turkey that is at odds with American policy. Obama and the GCC nations concluded last week’s meetings with little resolved, even as all sides know they must ideally find some resolution ahead of the June 30 deadline for the U.S.-Iran nuclear treaty. The old order is in flux. Iran is no doubt watching traditional allies snap at each other over its ascendancy with some satisfaction; discord only plays to its advantage. All three sides — the United States, the GCC and the Iranians — are watching the clock. What will be their next moves if time runs out? Mebbe SWATO (South West Asia Treaty 0rg.) or Saudi Wahhabian Arabia Treaty Organization, more egregiously! The Middle East seems a large land mass with various competing tribes instead of nations with discrete boundaries which we all know are arbitrary and faux due to foreign insistance. Power sharing is not yet in The Middle East’s DNA. Sadly the ethos of power sharing is almost defunct here in the USofA. Those who refuse to share power today in the USofA are consistent in their dogma. They believe in absolute rule in the sky by a despotic unmarried deity and absolute rule here by just one group or party.